After a long and exciting day of poker, Dung Nguyen has been crowned the champion of Event 38: $1,500 No-Limit Hold’em. Nguyen overcame a field of 2,502 players to take home all the glory, the $607,200 first-place prize and of course, the World Series of Poker gold bracelet. When the play began today, there were 21 players still in contention to take it all down. However, for the final table to be set, 12 players had to fall by the wayside. 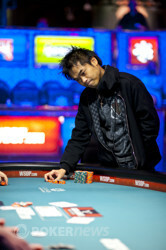 Jia Liu was the first player to do just that, hitting the rail in 21st place. Next to go were Bastian Fischer (20th), Jason Lester (19th), Jesse Wilke (18th) and Michael Borovetz (17th). Blake Cahail was still in contention at this point but would end up hitting the rail in 16th place when he had short stack all-in holding against Tyler Patterson’s . No help came for Cahail and he was sent home. Mihails Morosovs was eliminated in 15th place just a short while later and then Marcus Gurley (14th), Miguel Proulx (13th) and Ricky Crandell (12th) joined him on the rail. When Matthew Pierce started the day, he had one of the largest chip stacks in the room. It didn’t stay that way though as he busted in 11th place, bringing us to our “unofficial” final table. At this point it was Dung Nguyen who lead the way, while Scott Clements was the short stack. He was so short in fact, that it didn’t take long for him to get his stack in. The last hand of Clement’s tournament saw him all-in preflop holding . Unfortunately he ran into the of Theo Tran and when no help came for Clements, it was all over in 10th place. Here’s how the final nine stacked up. As you can see, it was Dung Nguyen who went into the final table with a big chip lead and it stayed that way as Tyler Patterson was sent home in ninth place and Jeffrey Manza in eighth. Nguyen was the player to eliminate Manza, with Nguyen putting Manza to an all-in decision on a board. After tanking for a long time, Manza called and rolled over , well behind Nguyen’s . The turn and river changed nothing and Nguyen gobbled up more chips as we were down to seven. Zachary Korik was the next player to hit the rail, eliminated in seventh, with Blair Hinkle the man to deal the fatal blow. Hinkle, who started the final table with the smallest stack, was now sitting pretty and looking good to make it even deeper in the tournament. Kristijonas Andrulis was the next player sent home, with his sixth-place elimination seeing him run his short stack holding into the of Nguyen. There was no stopping Nguyen at this point, with more than half the total chips in play being part of his towering stack. The fifth-place spot would end up being filled by two-time WSOP gold bracelet winner , David Pham. The end of Pham’s tournament saw him all-in holding against Bahman Jahanguiri’s . The kings held up and Pham was sent packing. The play really slowed down at this point as Nguyen continued to edge away from the competition. Blair Hinkle was one of the four remaining and he is one player who has seen success on the big stage of the WSOP before, winning his first gold bracelet in 2008. He will need to search for that second bracelet elsewhere though, as he was eliminated in fourth place earlier this evening. Three-handed play would last a very long time, but it was Bahman Jahanguiri who would end up finding the rail in third place. After dozens of hands with barely any action, Jahanguiri would suddenly ship his stack all-in preflop holding and have to come up against Nguyen's . The board was uneventful and Jahanguiri was sent home. Coming into heads-up, Nguyen held an almost 3-1 chip lead and would carry that lead all the way to a victory. When the last hand of the night played out, Nguyen's rail burst onto the stage and he was practically tackled by several well wishes. 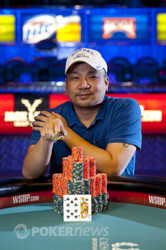 It was great to see and we congratulate Nguyen for taking down the bracelet and the $607,200 to go along with it. That's all from us here in Event 38. Be sure to check out the action of all the other exciting WSOP events taking place right now. Until next time! 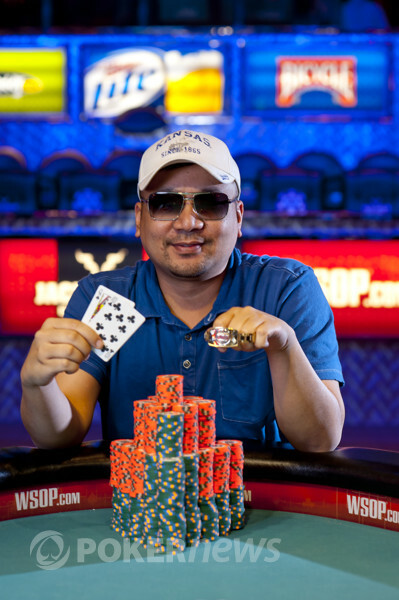 Dung "Gomer" Nguyen bests a large field in Event 38 to capture his first WSOP Gold Bracelet. He defeats Theo Tran heads up to take the top prize. The first time Theo Tran got his stack all-in preflop and received a call from Dung Nguyen, he was in great shape to double-up. Tran held and Nguyen was behind with . When the flop was dealt on the felt, Tran was still in front and looking good. At this point Nguyen's rail was up on their feet, screaming for a queen. They wouldn't get their wish, but a would be enough to put Nguyen in front. It was looking bleak for Tran, but he now had outs to the flush as well. He needed any ace, any king or any diamond. However, it wasn't meant to be as a dealt the final blow to Tran's tournament life. For that great effort, Tran goes home in second place, taking home $377,565. That is the second time that Tran has finished in the runner-up spot in a World Series of Poker event and as such, we are sure he will be even hungrier to find his first bracelet soon. Theo Tran was on the button when he raised it up to 200,000. Dung Nguyen made the call and a [4d3c2ws] flop was dealt on the felt. Nguyen check-folded here and Tran took down the small pot. Theo Tran has picked up a few chips by getting aggressive preflop. Tran three-bet shoved and didn't get the call on one occasion. He took down another couple of hands by simply getting Nguyen to fold preflop. Dung Nguyen just took down a small pot holding on a board. It was a limped pot preflop and both players checked the flop and turn. The river would see Nguyen check-call a bet and then Tran would muck his hand and send the pot Nguyen. Both players are back early from their break and are ready to play some more poker.